This week the LFR (aka first 4 bosses) in the Siege of Orgrimmar opened up, Vale of Eternal Sorrows. I couldn't find LFR guides (except for PTR), but they appear to be for 10-man which has to be as close as we can get. Spread out evenly around boss. This is key to step 4 below. Avoid the blue spirals on ground. They appear to be water spouts and will shoot you in the air. The boss will 'split' (very ying yang) into dark and light blobs. I ran back to edge and turned around. The blobs form at the back edge of the circle. Kill the dark (infection) blobs and heal the friendly light blobs. When they reach the front edge, they join the water and do an AOE damage. This is usually where everyone dies. Save a big heals (healthstone, etc) for this time.. I am not sure if being ranged would helped. If so, maybe warlock teleport to back of area. Boss reforms and starts over at 2. It was basically a DPS race to beat his enrage timer. If he has another phase I haven't seen it. Simple. three protectors; all three need to die within seconds of each other. Follow the raid as they bounce between the players. If you see a dark bubble appear over one character, run for it. Kill adds that randomly spawn around boss. Each is supposed to remove 'corruption' but my bar never dropped below 75%. Don't get hit by beam. This is like the water stream on the Wise Mari in the Jade Temple. I put down my lock portal, then as the beam passes it coming toward me, port to other side. This boss is a bit of a LFR coordination nightmare. The basic statement in raid chat was "if the sha is casting, spread; otherwise stack". The Sha has 4 disks surrounding him. These are prisons. Facing him on front left and back right. Randomly he picks 2 people and imprisons them in these. To release the people, there are two pads to stand on. I suggest dropping your warlock portal on one of the pads. To shorten the trip to the opposite prison, drop your gateway over there. That way 2 people can free the imprisoned player then run back. DPS and heals stack on the Sha's tail. Norushen will randomly drop buffs on selected raid members and if you are within 8 yards, you will also pickup the buff. When Sha casts Self Reflection, adds will spawn from a bunch of people's feet. I don't believe spreading helped, but on the successful run, we did. Jump from the purple puddles where they are spawning, then kill adds. Portal to prison pads to release trapped players. Sha casts Swelling Pride depends on your pride bar. 0-24, do nothing. 25-49, spread out from group because you are about to explode for damage. 50-99- find a puddle marked with hunters mark (around 1 minute mark in video) and stand in it. 100 - next swelling pride you will become mind controlled by sha. On our successful kill, I never reached above 24 pride. According to AskMrRobot, there are 13 drops in this wing that are useful for me that are decent upgrades! Due to the free loot from Timeless Isle (all of the timeless armor kits are iLevel 496, which will easily put you above the requirement), you'll get a lot of really really bad players. I put 2 through LFR yesterday. There was some serious problem with my mod while tanking, and I was doing 9 frame per second. Odd when I was doing it on my DK dps, I didn't have that issue. Sadly, I agree. 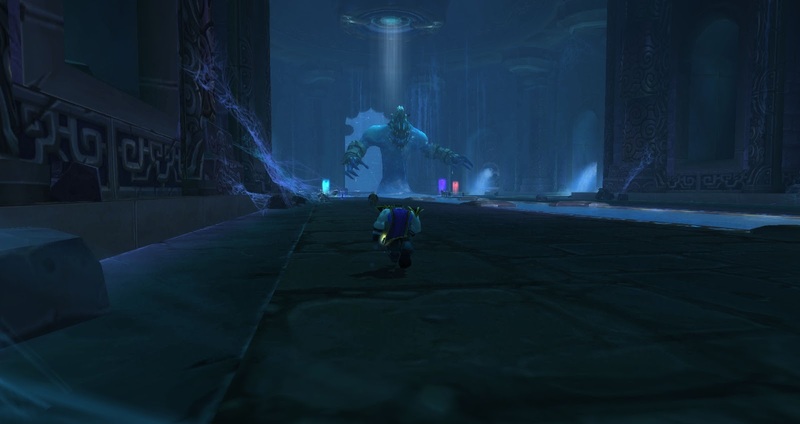 With it being the first week, the regular raiders are not running it LFR yet outside their raid groups. The casuals like myself are mostly not on the boss mechanics. Kill the enemy blobs, heal the friendly blobs!!! I went through 3 iterations last night on the same first boss, Immerseus. It's really bad when myself, warlock and the priest on the platform with me are the last two people standing.